Ceredigion  is an extensive county in mid Wales (440,630 acres (1783 km²)). 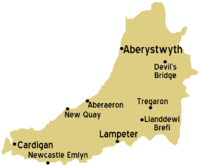 A partly coastal county, it is bordered by Cardigan Bay to the west (part of the Irish Sea), Gwynedd to the north, Powys to the east, Carmarthenshire to the south, and Pembrokeshire to the south-west. Population 64,000. It corresponds more-or-less to the historic county of Cardiganshire. Ceredigion's strongest draw is its stunning, raw, ragged coastline - along with Pembrokeshire and Cornwall it boasts some of the whitest sand beaches and pristine clean turquoise blue/green waters anywhere in the UK. With zero industrial discharge enhancing the already excellent water quality (many Ceredigion beaches annually win the prestigious and much coveted blue flag awards) it is no surprise that Cardigan Bay summer visitors include bottle nose dolphins, basking sharks, porpoises, grey seals and other rare aquatic wildlife. Dolphin visits can be arranged at the charming town of New Quay. The Welsh-language name Ceredigion means 'Land of Ceredig', who was a son of Cunedda, a chieftain who reconquered much of Wales from the Irish around the fifth century CE. Aside from the long coastline on Cardigan Bay, much of Cardiganshire is dominated by the Cambrian Mountains. This page was last edited on 10 July 2016, at 07:59.